Warning: this resource may contain references to and images of Aboriginal and Torres Strait Islander people who have passed away. Bran Nue Dae, both the stage play and film, defy expectations of Aboriginal texts and Australian films in general. Chi and Perkins have achieved this by appropriating Western genres and tropes, delivered with a strong dash of irreverent humour. As part of the students’ personal responses to the text, it is important to acknowledge and openly challenge mainstream Australian expectations of texts written, directed by or focusing on Aboriginal stories. To assist in this, break the class into two groups. Each student will complete a survey at three key introductory points to the text. One group will be introduced to the film as an Aboriginal text of great cultural significance. The other, will have the film sold to them as a vibrant musical of a young man fleeing school, rebelling against his mother and finding love. After these introductions, survey all students to gauge their enthusiasm for the unit. Use the Bran Nue Dae introductory survey (PDF, 484KB) to do this. After this point, show the students the trailer and have them complete the post-trailer survey. You may wish to also show them the SBS review. During the teaching of the unit, have a designated noticeboard or section of the classroom wall covered with butcher’s paper, where students may leave questions or comments about the film and the unit. Using sticky notes available from the teacher’s desk is an easy way to facilitate this. After having watched the film, have the students complete the final part of the survey. Tally the results and analyse them for trends across the two groups. Break the class into smaller groups and provide them with the raw data. Have them identify one trend in the data and present a hypothesis as to the reasons for this. Provide students with images of the key characters in the film. Have them select the character with whom they identify the most and stick this image into their book or cut and paste into a Powerpoint slide or mind mapping application. Have them brainstorm the reasons why they identify with this character. 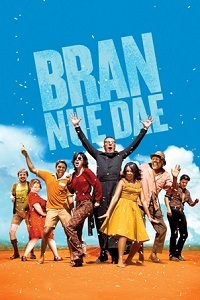 Bran Nue Dae tells the story of a young man, Willie, who lives in Broome with his mother and is in love with a local girl, Rosie. At the start of the school year he is sent back to Perth, under the care of a strict German priest. Willie ends up running away from school and finds himself lost and alone in Perth. He befriends Uncle Tadpole, a streetwise man, who agrees to take him home to Broome. Uncle Tadpole tricks a German tourist and his hippie girlfriend into driving them the almost 2,500km trip. Willie is also racing against time to ensure he can win the heart of Rosie. The film follows their escapades on the road, and the diverse characters they encounter. On their return to Broome a series of secrets are uncovered. Willie Johnson (Rocky Mackenzie) is the teenage protagonist, torn between his devotion to his mother and her expectations of him and his love for Broome and Rosie. Theresa Johnson (Ningali Lawford) is Willie’s protective and strict mother, desperate for her son to become a priest and have a successful future. Uncle Tadpole Johnson (Ernie Dingo) is the wily charmer who takes Willie under his wing. Father Benedictus (Geoffrey Rush), the German priest and headmaster of Willie’s boarding school, is Willie’s nemesis. Rosie (Jessica Mauboy) is an aspiring singer and Willie’s love interest. She is also being pursued by Lester (Dan Sultan), the older, more experienced singer in the local band. Slippery (Tom Budge) is a highly-strung German back packer travelling with his girlfriend Annie (Missy Higgins) a hippie, who is keen to learn from Uncle Tadpole’s cultural wisdom. Bran Nue Dae is a deceptively dense and rich film. Whilst it is vibrant, funny and fast-paced, there are many complex issues and ideas touched upon within the songs and other aspects of the film. The key theme is Willie’s struggle to find a place in the world that is true to himself. This sense of displacement is keenly portrayed and is echoed in the men he spends the night with in Broome. Their lifestyle is a powerful warning to Willie to find his place or be doomed to wander lost forever, as highlighted in the song ‘I go back home’. Colonisation is, inevitably, a powerful theme throughout. It is most obviously represented by Father Benedictus who sees his mission as raising the Aboriginal people up out of their lowly situation. He represents the intrusive and paternal face of assimilation. Annie, is a more benign form of a similar idea. She sees Uncle Tadpole as a caricature of a wise elder and does not appreciate the complexity of his life and the power of the real wisdom he does bring to Willie’s life. The police at Roebourne are the violent face of oppression. The beating of Willie and the resigned way in which Uncle Tadpole prepares for their inevitable incarceration is a compelling reminder of the reality of deaths in custody as being something that happens to actual people, not just ‘the other’. Provide the students with a map of Western Australia (PDF, 93KB) with Perth and Broome noted. Have the students mark on the map where Willie meets key characters such as Uncle Tadpole, Slippery and Annie, the football team and Roxanne. This will serve as a point of reference throughout the unit and a quick revision for students on moments in the film they may forget. Aspects of the text that they enjoyed (e.g. the humour, the setting, the music). Characters they identified with or liked and their reasons. Key themes/ideas in the text that they found important. Chi appropriates the Hollywood movie trope of the Road Movie in his structure of the play and this is further enhanced in Perkins and Cribb’s screenplay, with the addition of more stops and ‘interesting’ characters for them to encounter. This is intertwined with the razzle dazzle of the Broadway musical. Using these two much loved and much employed genres, Chi created a play, and Perkins a film, that proved immensely popular and commercial successes. Chi’s play toured nationally, won the Sidney Myer Performing Arts award and its commercial success was pivotal in creating the Black Swan Theatre Company. Perkins’ film grossed $2.5 million in its first week and over $7 million in total. The opening credits, in their playful, animated style set the tone for a joyful, high-spirited film which, with characters such as Roadhouse Betty, makes use of the Hollywood cliché of dangerous and eccentric characters to be encountered on the road. ‘Nothing I would rather be’ employs several of the great touchstones of a Broadway musical in its choreography, with a chorus line of school boys high-kicking in true Broadway style. Both of these appropriations make the film accessible and comfortable for a mainstream audience who are able to quickly read the structure and laugh at the gentle parody. However, these appropriations also allow Chi to utilise a much older tradition of song cycles. Songlines traverse vast distances across the Australian landscapes and hold the knowledge of the land within them. Due to their distances, no one people are custodians of an entire song cycle and instead, each holds and shares their songs as needed. This is echoed in Willie’s travels as he meets new people who share their song with him. Each of these songs brings new knowledge and strength to Willie, helping him became a man. Whilst not all of the songs are included in the film, they are still the glue that knits the film together and give it its depth. Contrasting the depictions of Uncle Tadpole and Father Benedictus gives an understanding of the range of the characterisation within the film. Rush’s portrayal of Benny borders on caricature. The accent, the black priest’s robe, his appearance on the beach, his snoring, are all cartoonish in their villainy. This could be representative of the role he plays in Willie’s life, the dominating and terrifying priest and principal, overseeing and determining the direction his path takes. Slippery also appears rather two dimensional in his characterisation until the closing scenes. This suggests that there is a wider point to be made about the Aboriginal characters fulfilling diverse and complex roles, while the Western characters are reduced to stereotypes, playing against form. Uncle Tadpole, in contrast, is a subtle and complex character. His outward humour and larrikinism is familiar. His mocking of Annie and Slippery’s expectations of him (‘Crocodile mob’, ‘Father a koala’) are irreverent and endearing. His sense of displacement is his central motivator, and is how we are first introduced to him. His homelessness and ‘sorrow’ serve as a warning to Willie about his need to find his place in the world or be doomed to a lifetime of pain. At Roebourne police station, Annie fights loudly and fiercely for justice. In contrast, a world-weary and experienced Uncle Tadpole moves silently to the counter and prepares for incarceration. His quiet acceptance of the inevitability of the situation speaks far more loudly to the audience than Annie’s vocal protests. The opening scene of the film sets up the plot and the points of tension in Willie’s life clearly in its two minutes. It opens with a long shot of the church’s altar, with the loud and fierce priest standing in the left of the frame. This positions the priest as Willie’s ‘given’, the way of life he is used to. On the right of the frame are four women singing beautifully, dressed up for church. They hold the position of the ‘new’ for Willie, the world into which he will move throughout the film. The camera zooms down the church aisle and pans in on Willie as his voice starts to dominate the soundtrack. It is in a two-shot with his mother that we are introduced to Willie. The camera pans back to the singers as they sing, sung clearly by Mauboy, ‘You may find that if you’re true to yourself…’ The camera zooms in for a closeup of Rosie and cuts repeatedly between Rosie and the two-shot of Willie and Theresa. Theresa continually shoots Willie concerned looks. This is followed by a series of increasingly intense close ups of Willie and Rosie, with Willie’s desire clearly written on his face. This culminates in Rosie emerging like the devil from a fire. We then see two contrasting shots of a statue of Jesus with the Sacred Heart exposed and then Willie pouring cold water over his head outside his home. The scene shows both his love for home and his mother. This triangulation for Willie between his mother, his god and his affection for Rosie is the metaphorical path he must navigate as he makes his way back to Broome. Break the students into small groups. Either allocate each group a song or allow them to select their own. Have them watch the scene several times (most of the songs are readily available on YouTube). Have them also re-watch the entire scene in which the song appears. If you have access to the play script, provide them with the lyrics. What new layer of meaning is added to the scene through the song? Think both musically and in terms of the lyrics. How does it enrich your understanding of the character? How does it reinforce or contradict other moments/ideas in the film? How does it strengthen your understanding of the film and its ideas? Make notes in this song analysis diagram (PDF, 166KB). It is initially very tempting to view Bran Nue Dae as a post-colonial text. The film (and the play) explore the sense of displacement of a people through colonisation; it touches on ongoing issues as a result of colonisation, such as homelessness, deaths in custody and alcohol abuse; it is a celebration of one young man’s escape from practices of assimilation, and; it achieved great commercial success within mainstream Australia. Another important way in which the play and film may be considered post-colonial is that they both come from a very Broome-centric view of Aboriginality. As Makeham wrote, ‘It is important to recognise, however, that Aboriginality is not, and has never been, a singular, fixed and empirically knowable thing; rather, Aborigines have always been the bearers and producers of diverse and highly adaptable cultures. The musical drama . . . celebrates this cultural diversity, but also the sense of racial solidarity which characterises contemporary Aboriginality.’ Chi is himself of Scottish, Japanese, Chinese, Anglo-Australian and Bardi descent. In Broome, a new sense of racial identity has been formed and Bran Nue Dae is a celebration of this. The play can be found in an anthology of post-colonial plays from around the world. Have students research and then write their own definition of Post-colonialism. Share the definitions as a class and help students make any improvements required to their definitions. Students list aspects of the film that they believe are post-colonial in nature. Aboriginal Australian writers and other artists are hesitant, sometimes loathe, to accept the term post-colonial to describe their work. Their arguments for doing so are well-captured in Anita Heiss’s entry in the Macquarie Pen Anthology Post-colonial – Not!. A simplification of the piece, is that as the work of colonisation in Australia is still ongoing, it is not possible to discuss a post-colonial Australia. This is most powerfully seen in the film in the scene at Roebourne police station. In this scene, the travellers are all arrested for suspicion of marijuana possession. Things rapidly disintegrate and Willie is assaulted by the police and they are all locked up for the night. Arguably, the most powerful scene of the movie is ‘Listen to the news‘, when Uncle Tadpole sings with the ancestors who come to watch over Willie. The location for this scene is incredibly pointed. In 1983 a 16-year-old boy was killed in custody at Roebourne station after being locked up for the night. This incident was one of the key events that led to the Royal Commission into Deaths in Custody. The lyrics of the song suggest the bleak reality of Aboriginal Australians in the line, ‘Listen to the news, talking about the blues of our people’. The tone in the song is ambiguous when discussing the future, at one point suggesting that ‘A new dawn is dawning . . . when the people as one rise’, but later questioning, ‘is this the end of our people?’ All of this is contrasted with images showing the strength of the ancestors as they surround Willie and appear to protect him. The image of a teenage boy at Roebourne police lock-up rising into the sky is a reminder that the work of colonisation is still being enacted. Watch Jimmy Chi discuss his inspiration for the play and some of the messages he hoped to convey through it. Students prepare one argument for and one argument against the proposition that ‘Bran Nue Dae is a post-colonial text’ and present it to the class. Students should use their definition of post-colonialism and Anita Heiss’s article to assist them. There are two key ideas to consider here. The first is the concept of cultural appropriation. Have the students read the first definition of cultural appropriation and then watch the second, which was created by a 16-year-old school student, who also happens to be an actor in The Hunger Games. Chi’s decision to appropriate the Broadway musical and Perkins’ choice to turn his play into a road movie would seem to be deliberate decisions to culturally appropriate these genres in order to make their texts appealing to a broad audience whilst still making a powerful political point. the extraordinary denouement on the beach, with an entire family reconciled through a series of confessions and providential coincidences, a feature of classic comedies. Hold a class discussion in which you consider whether or not these two characteristics of the film can be justified as common features of musicals and thus to be expected and accepted by the audience. Experience with other musicals will be necessary for this conversation and may be set for homework. Students are to pretend that they will be visiting another country on a student exchange. They are to prepare a presentation to their new class on their life in Australia. Students are encouraged to use presentation software (such as PowerPoint or Prezi) to supplement their speech. The aim of the presentation is to introduce life in Australia beyond the commonly recognised clichés. Students should focus on these areas, although creativity and flexibility are encouraged. Home life: family, family expectations of you and your career/education, your house, your neighbourhood. School life: what subjects are studied, how you are taught, what happens during break times, extra-curricular experiences. Social life: what do you do in your spare time; sports, outings, gaming, music. Discuss your experiences/knowledge/perception of Aboriginal Australia. Suggest why watching Bran Nue Dae might help their audience understand Australia and Australians a bit more. Select one other Australian film, novel, TV show etc. that you feel accurately represents an aspect of your life in Australia. Discuss how you relate to this text and what it shows about your life. When it differs from your life explain this, too. The presentation should be no longer than 5 minutes. Please see the attached student exchange marking criteria (PDF, 114KB). Hand back to students their pre-viewing survey. Discuss with them why some of their initial expectations may not have been met. Write some of the students’ initial expectations on the board and suggest possible reasons for why they may have changed, e.g. increased understanding of the use of appropriation, identification with specific characters, etc. Select one short scene from the film and complete the table for the class. Explain your decisions as you fill in the table. Church altar, bright colours, well-lit, priest in white, girls in orange. Beautiful singing, with it being increasingly drowned out by the priest. Starts at eye level, long shot, starts zooming up the aisle. Give the students the information in as many columns as they need for as many scenes as they need to be able to complete this in a group. Have the students re-watch a scene in a small group and complete the table for this scene. Have the students complete this table for at least two scenes of their own choosing. Students should now have five completed scene tables. For each scene table, students need to consider how the meaning they have found in each scene links to bigger ideas around the movie. To assist in doing this, the class should brainstorm a list of these concepts to be displayed. They would include: displacement; belonging; rebellion; love; cultural appropriation; colonialism and possibly others. Bran Nue Dae is a coming-of-age film that will appeal to a broad audience. Discuss how it uses popular film techniques to discuss concepts particular to Aborignal Australia. Evaluate how universal you consider both the mode and ideas of Bran Nue Dae to be. Duration 5 Weeks: this allows for time to view the movie. EMMA LE MARQUAND has worked in NSW Department of Education schools for 18 years, mostly teaching English. She has a Master of Arts in Literature and is particularly interested in Jane Austen and Aboriginal literature. Emma currently teaches at Katoomba High School.